34 A report of the Royal College of Physicians, “Obesity”, Journal of the Royal College of Physicians of London, (January 1983). 35 Metcalf et al, “Fatness leads to inactivity, but inactivity does not lead to fatness: a longitudinal study in children (EarlyBird 45)”, Archives of Disease in Childhood, (June 2010). 36 Rotterdam Consensus Workshop Group, “Revised 2003 consensus on diagnostic criteria and long-term health risks related to polycystic ovary syndrome”, Fertility & Sterility, (January 2004). 37 Wilhem Falta, Endocrine diseases including their diagnosis and treatment, (1923). 38 George N. Wade and Janet M. Gray, “Gonadal effects on food intake and adiposity: A metabolic hypothesis“, Physiology & Behavior, (March 1979). Finn Molgaard Hansen, Nibal Fahmy and Jens Hoiriis Nielsen, “The influence of sexual hormones on lipogenesis and lipolysis in rat fat cells“, European Journal of Endocrinology, (1980). These represent two examples. 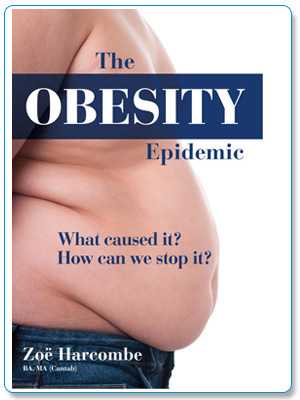 The evidence is so extensive that the term “ovariectomy-induced obesity” is widely used. 39 W.S. Leslie, C.R. Hankey and M.E.J. Lean, “Weight gain as an adverse effect of some commonly prescribed drugs: a systematic review” QJM, (June 2007). 40 DCCT Research Group, “Influence of intensive diabetes treatment on bodyweight and composition of adults with type 1 diabetes in the Diabetes Control and Complications Trial”, Diabetes Care, (2001). 41 UKPDS Group, “Intensive blood-glucose control with sulphonylureas or insulin compared with conventional treatment and risk of complications in patients with type 2 diabetes”, The Lancet, (1998). 42 Marbury T., Huang W.C., Strange P., Lebovitz H., “Repaglinide versus glyburide: a one-year comparison trial”, Diabetes Research and Clinical Practice, (1999). 43 Must A., Spadano J., Coakley E.H., Field A.E. et al, “The disease burden associated with overweight and obesity”, Journal of the American Medical Association (JAMA), (1999). 44 Colditz G.A., Willet W.C., Rotnitzky A. et al, “Weight gain as a risk factor for clinical diabetes mellitus in women”, Annals of Internal Medicine, (1995).